High School Athletes honored in breakfast ceremony by Post 601 - Jewish War Veterans of the U.S.A.
Jewish War Veterans Memorial Post No. 601 honored four top scholar/athletes from Cumberland County High School, on Sunday, June 3, at the 45th Annual Olympiad Awards Breakfast, at Beth Israel Congregation, in Vineland, NJ. 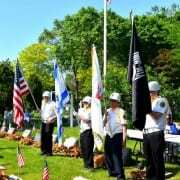 The ceremony, catered and co-sponsored by the Beth Israel Congregation’s Men’s Club, has been held each year since 1974 to memorialize the nine Israeli athletes who were brutally murdered by Arab terrorists at the 1972 Olympic Games in Munich, Germany. 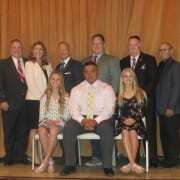 It publicly recognizes and honors the top scholar/athlete seniors from the five county high schools. 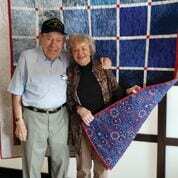 Jewish War Veterans Memorial Post 601 member Gerald Batt emceed the ceremony. This year’s winners and the sports in which they specialized in addition to their scholastics were: Alesandro Valdez (football, winter and spring track), Bridgeton High School; Sara Loew (cross-country, winter and spring track), Cumberland Regional High School; Morgan Giordano (girls soccer, girls basketball), Millville High School; and Tess Fisher (tennis), Vineland High School. 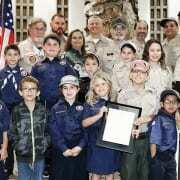 Each received commendations and proclamations at the ceremony from national, state, county, and local officials. 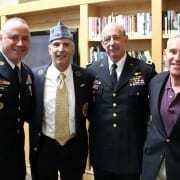 The winners, according to Stephen Paull, Commander of Jewish War Veterans Memorial Post 601, are selected by their respective schools, based on both scholastic and athletic achievements, as well as leadership, cooperation, civic contributions, and all-around good citizenship. The schools rely on input from guidance counselors, teachers, athletic directors, coaches, and principals. The winning students must be seniors, must have lettered in two or more varsity sports, and must be considered prime examples of good citizenship and leadership. The students are all near or at the top of their classes. A number of past winners have been valedictorians and several have won appointments to various United States service academies. The Beth Israel Congregation Men’s Club has been catering this breakfast since the event’s inception. Paull said the students being recognized present a fine example for the future.